B2B copywriting is often an altogether different ball game. However, that doesn’t mean that advice that applies for improving conversions doesn’t make sense here. But there’s a difference between writing for B2B and B2C audience. While B2C customers are the sole decision makers, B2B customers need approvals from a slew of decision makers. The purchase decision isn’t a singular thought but a collective thought. Here are the tips that can help you make the most of your B2B copy. While a light tone would appeal to most B2C customers, appealing to a B2B audience requires that you put forward a professional tone. Not only are the number of decision makers higher, but a lighter tone may put of senior executives who believe professional tone also mirrors professional commitment. Often the purchases are for the long term and require costly overhauls. Hence a professional tone is often the key to good conversions. That’s not to say that you are supposed to use trite, hard to understand language. An Easy to understand language used professionally will often do the magic. The headline should be carefully crafted. It isn’t enough to spend hours crafting the perfect piece of content and scribbling just anything for the headline. The headline should be short with 6 words being the ideal length. Often people only read the first and last 3 words. It’s important to keep that in mind when creating headlines. Here’s an example of a great headline. The homepage is the heart of your site. The homepage copy should be able to generate interest. A buyer persona can be key in understanding what kind of homepage copy to create. A buyer persona is an approximate representation of your ideal client. You can use several sources to conduct research required for creating the buyer persona. Facebook is one place that lets you search for different audiences and understand their interests. You can also dive into Google analytics to understand in greater depth about your visitors with the Demographic tools. Content personalization can very well lead to great improvements in how the content is received. The very fact that you have gone to great lengths to create content that speaks directly to them can appeal to the readers and make them more receptive. The people you’re writing to are in different stages of conversion and also do different roles. Some may be C-level managers, some others SEO executives, still others marketing managers and so on. A vocabulary that a C-level executive may be familiar with isn’t the vocabulary that an SEO executive would be using. Learning what they say and how they say it goes a long way in ensuring that your story gets ears. AirClic, a company that helps track shipments has a homepage that simplifies the core concept behind what they do, so much so, that you can understand what they do in under 10 seconds. It’s imperative that you spend time learning about your client. What kind of business does the client run? Who are the ideal customers? What’s the product? What kind of problems does this product solve? Well, you get the flow. If you understand these things well, you’ll be able to create a copy that resonates well with what they have in mind and thus improve conversions with ease. There’s industry specific jargon that is used at large only in a particular industry. Terms like Click through rate generally appeal to people working in email marketing. There are specific buzzwords that are commonly used among the peers. For example, often in B2B blogs dedicated to CRO, I see the oft-used term “conversion killers”. Is there any buzzword that’s often repeated in your industry? If so, use those terms. But not if self-praise appears to be something else. If you talk about how good you are in indirect terms then that could create a positive image in the minds of the readers. 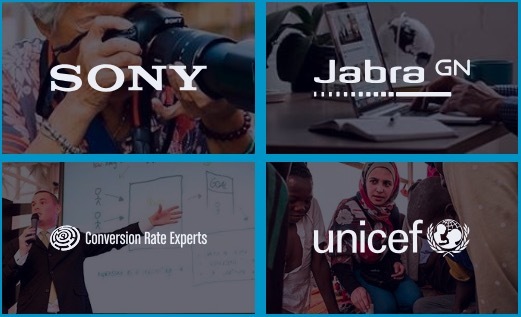 Instead of saying “We are the best CRO agency” say “We have helped 2500 companies optimize their conversions.” The latter statement is tangible, conveys what you do and creates a great image. HelpScout does it with style. Not only do they say that they are the best, they infuse humor into it. So you have listened to all the good advice on creating a killer B2B copy. It’s important to remember that it’s an entirely different audience who you’re writing for and thus the copy should be relevant to them. Your company’s content should stand out from the rest. The only real way to do that is by creating content that’s insanely useful, easy to read and implement. You may not see results in one day. You may not see results in a month. But a few months down the lane and you will see concrete results.